"They say Auguste Escoffier created this dish in honor of the opera, La Belle Helene, but we chefs know the real reason. How else are you going to use up bruised pears in such a delicious and beautiful way?" Place water in a heavy pot. Stir in zest and juice of 1 lemon. Place pears in pot. Split the vanilla bean lengthwise and scrape out the seeds. Add the seeds and split pods to the poaching liquid. Pour in sugar. Bring pot to a simmer over medium-high heat; stir gently to dissolve sugar with minimal jostling of the pears. Reduce heat so pears continue cooking over a steady, gentle simmer. Pears need to stay submerged, so place a small plate over them in the pot to keep them under the liquid. Simmer until pears are just tender, 20 to 25 minutes. (Remove plate to test the pears for doneness.) Remove pot from heat and let pears cool to room temperature in the poaching liquid. Transfer pears and vanilla beans to a storage container and cover with some of the poaching liquid. Cover and refrigerate until pears are thoroughly chilled, several hours or overnight. Reserve all of the poaching liquid (see footnote). Heat hot fudge sauce in a saucepan over medium heat until warm. Dip base of pear into the chocolate and spoon chocolate along the sides except for the top inch or so of the pear. Place dipped pears in individual serving bowls with another generous spoonful of syrup and a small scoop of vanilla ice cream. A small melon-baller is a great tool for removing pears' cores. 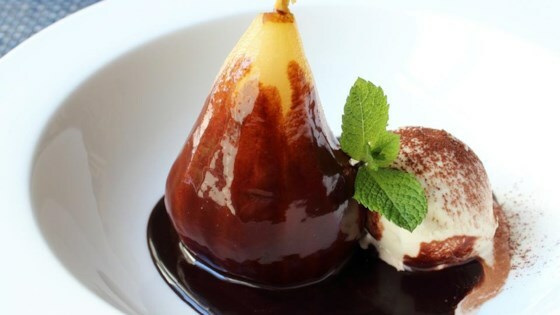 You can also coat the pears with a classic ganache. For this recipe, use 2 parts cream to 1 part chocolate (by weight). As far as the extra vanilla poaching liquid goes: you'll want to strain it, pour it into some cool-looking bottles, and give it away as edible gifts. The taste is incredible. This would make a fantastic holiday treat for the wannabe mixologists in your life. This took awhile to make but it was worth the wait. super easy & delish! ...and I don't even like fruit desert, usually. Excellent! I brought them to a dinner party and everyone loved them. I used only 1 cup of sugar and it was plenty. Your method of removing seeds wastes fruit. I sliced ready to eat pear lengthwise and easily removed seeds AND stem. Definitely will make this dessert again. Easy, pretty and delicious. Fantastic! Have to use dark to semi sweet chocolate sauce!